Nassau, The Bahamas — The 2010 national statistics recorded that the population growth increased to 353,658 persons in The Bahamas. The population change figure increased by 50,047 persons during the last 10 years. After Asian Correspondent posted the story on April 11th, it was picked up by news outlets around the world, such as Investor News and American Spectator, and was referred to in yesterday’s Australian newspaper and even got a mention on Fox News. Only one small problem there, UN people: a little annoyance called Google Cache, which has that page archived here. Google Cache pulls up the page that had been removed, with the “50 million refugees” title, but the map is missing. Fear not, dear readers, because as astoundingly smart as those UN people think they are, they forgot one very important yet tiny detail. 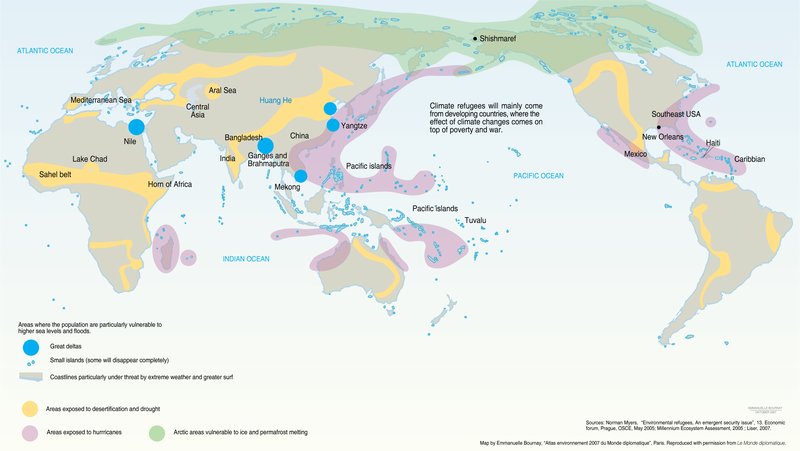 The map links to a hi-resolution version of the “climate refugee map,” and if you delete the page above and the map it contains, you also have to delete the hi-res image it links to. I’m always happy to help the UN in times of “need,” so I’ve recovered it and saved it, because that image link is likely to go down the memory hole on Monday. And here it is in full-sized hi-resolution glory, suitable for printing, slides, or coffee mugs…wherever it might be appropriate to show the folly of these boneheads. And there you have it, folks, another bogus climate claim rubbished by reality, followed by an inept cover-up attempt. Thanks to the reality of census numbers, followed by the UN’s handling of this, we can now safely say that the claim of “climate refugees” is total fantasy. Be sure to leave comments on any website that makes this claim, and link to this and the Asian Correspondent website. Kudos to Gavin Atkins for asking this simple question after six years of this fantasy being used to push an agenda. Update 1: The American Association for the Advancement of Science now says that there will be 50 million climate change refugees by 2020. Update 2: Another blogger, following the lead by Gavin Atkins, Mr. Aaron Worthing at Patterico’s Pontifications, was the first to note the 404 error on the UNEP website, but he did not recover the hi-resolution map shown in this story. Anthony Watts operates the most visited blog on climate science in the world, www.wattsupwiththat.com. Correction: An earlier version of this story incorrectly attributed a recent estimate that there will be 50 million climate change refugees by 2020 to the UN. In fact, that prediction was made by the American Association for the Advancement of Science, though the original prediction that there would be 50 million climate change refugees by 2010 was in fact made by the UN.